Ninety years ago this month, in late August of 1922, Al Capone was involved in the first dust-up big enough to get his name into the Chicago paper. 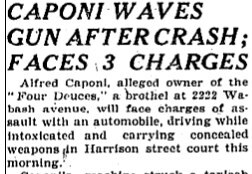 They referred to him as Alfred Caponi (they’d keep calling him “Caponi” for years) in the brief item describing an altercation in which he comes off as a massive douchebag. Al, it seems, was driving around the loop, drunk out of his mind, and crashed into a parked cab at Randolph and Wabash, injuring the cab driver so badly that he needed hospital attention. Capone was arrested and taken to the Central police station, where he threatened to have the arresting officer fired, and told anyone who would listen that he had “pull” that would make life miserable for all of the cops present. “I’ll fix this thing so easy you won’t know how it’s done,” he declared. Capone was booked on three charges: assault with an automobile, driving while intoxicated, and carrying a concealed weapon. True to his word, he was bailed out and never went to court to deal with any of the charges. At this point in time he was still working for his mentor, John Torrio, who may have been the first gangster ever to say “I own the police” and mean it. You wouldn’t have caught Torrio out driving drunk and waving guns around, though. Capone got better at P.R. later; in 1922 he was just a kid in his early 20s and acting like a frat boy whose daddy is on city council. He was right, though, about being able to “fix” the thing – the case never went to trial.